Edik Baghdasaryan is currently the head of the Investigative Journalists’ NGO and Editor-in-Chief of the HETQ Online newspaper. He also teaches courses in Investigative Journalism and TV Journalism at Yerevan State University. 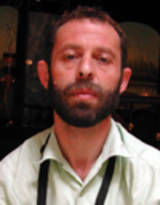 He holds degrees in TV Journalism from Moscow State University and from the Philological Department at Yerevan State University, and he has won several professional awards, including: OSCE, 2005 for “Environment and Human Rights”; Internews Armenia, 2002 for the best TV investigative film of the year titled “Track”; and Yerevan Press Club, 1998, for “Best Investigative Film.” Mr. Baghdasaryan has been invited as a trainer to share his skills in the field of investigative journalism by many international organizations and institutions, including the Caucasus Media Institute, Internews-Armenia, and OSCE-Kazakhstan. He is also the author of dozens of documentary films. More than one hundred of his articles are available at Hetq Online, which continue to be republished by local and international newspapers.